Jeff Bloovman is a lifelong traditional martial artist and student of the gun. Having grown up around firearms, Jeff was taught from a young age to respect their capabilities and the importance of incorporating them into his martial studies. He believes firearms are tools that in capable hands can mitigate physical disparities between predators and their intended victims, thereby leveling the dangerous playing field of the violent assault paradigm. He feels that regardless of age, race, gender, sexual orientation, or political ideologies, at the end of the day we are all ultimately responsible for our own personal protection. 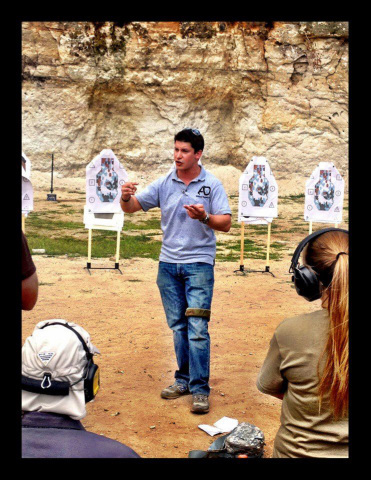 In 2004 he took his first formal firearms class, and quickly realized that despite having shot guns since childhood, he had a tremendous amount to learn about successfully employing them to save lives. He's studied under Paul Gomez, Marcus Wynne, Dennis Martin, Craig Douglas, Nick Hughes, Michael de Bethencourt, Jeff Gonzalez, Tom Givens, Steve Fisher, Freddy Osuna, Joe Weyer, Scott Jedlinski, Shay VanVlymen, John Johnston, William Petty, Daniel Gracie, Sideco Honorio, Chip Hart, Andy Carr, Dr. Steven L. Sun, Kevin Clanton, Joe Breidenstein and other top level tactical and martial art trainers. He believes that there is no “one source” who has all the answers, and that every great instructor has a unique perspective on life-saving techniques as well as a distinct style of communication. Therefore, he constantly seeks out the tutelage of other reputable instructors in a never-ending quest for cutting edge training tools and defensive technology. He feels privileged to be in a position to help you achieve greater confidence in your abilities to protect yourself and your loved ones. In 2011, Jeff had the unique opportunity to compete on Discovery Channel’s show, One Man Army. In Episode 1 “Brothers In Arms” his opponents came from varied backgrounds including the US Marshals Service, Civilian Contracting, and Delta Force. Jeff won every challenge, eliminating the opposition and winning the title of One Man Army, quite an accomplishment considering the pedigree of his peers. He has been a featured expert on the Discovery Channel, VICELAND, History 2 Channel, American Heroes Channel, ABC 6, Washington Post, Rolling Stone, Huffington Post, and others. He is a licensed RN, BSN in the state of Pennsylvania. From the years 2005-2010 while continuing his martial studies, Jeff was incredibly fortunate to study acting and directing under several great teachers including George DiCenzo. On the stage as an actor and backstage as a director, his peers lauded him for his impressive communication abilities. He feels that his time spent acting and directing was extremely helpful in his current position as an educator. Communicating in a thoughtful and succinct manner tailored to each individual, results in superior retention and understanding. Jeff’s mission, as an instructor is to use plain language to break down seemingly complex techniques into a dialogue that is both easy to understand and palatable. His students must not only understand how to draw, shoot, reload, clear malfunctions, fight, and render medical aid, but also the why behind all of those actions. Regardless of which Armed Dynamics class you take, Jeff has one ultimate goal: to create free thinking tacticians.